Two stage Contests on the web and/or on Facebook have general entry and voting for stage 1, and then the contest is narrowed down to a specified number of finalists set by the contest admin for a stage 2 final voting time period. This in demand feature allows the Contest Admin to set the number of finalists for the stage 2 voting. Admins then set the date when stage 1 voting ends and the contest moves to stage 2 voting. Finalists for stage 2 are determined by the voting in the general first stage of the contest. Votes do not carry over, they simply start from zero again in Stage 2. Example: An Admin can set their contest to run for 10 days and have a Finalist Stage voting for the last 7 days where fans come back to vote on the top 5 vote getters who makeup the finalist round. The Voting Options section is the second sub-setting of the App Builder page. It lets you assign the voting frequency of the app either “once per 24 hour period” (24 hours after their last vote) or “once per contest/stage”. 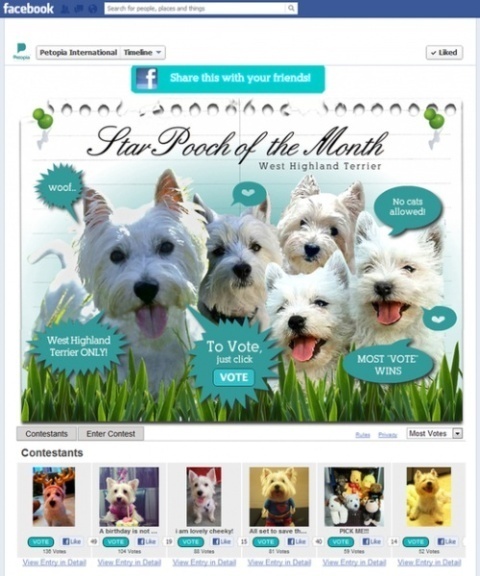 Another option for the page enables you to choose how many votes per contest/stage. All you have to do is key in the quantity you prefer. There are 2 ways to set your voting instruction; either by writing it into the text area or via your customized image (Adjust its page position and make sure it is 800 x 310 pixels). The last option is the Two-Stage Voting. This option allows you to run a general contest open to all to vote on and then to run a finalist voting round to determine a final winner. Finalists would be determined by number of votes in the initial stage one voting, and you can set the number of finalists for the stage two voting. Simply click the checkbox to enable this feature, then set the number of finalists you want to have in the last stage. The text box that appears is the text that will be shown at the top of the stage two voting page to alert users that these are the finalists. Under “Contest Setup”, you will set the dates for the start of stage one voting and the end of the contest overall; then, set the start date of stage two to fall between the other two dates. Shown below is an example of a 2 Stage Contest in the Finalist Round where 3 finalists remain to vote on. 14 Day Free Trial Available on any Premium App! Contests with TabSite allow for a simple method to reach the friends of contest entrants and voters by the social sharing tools upon entering and upon voting. All TabSite contest tabs can have a Like Gate option, enabling your Facebook Page to capture the Like which is a most important base connection with the user. Use the Like Gate! Upon entering the contest a user has ability to share their entry. Enable all social sharing options to help the user share your entry on Facebook, Twitter, Google+, etc. Entrants can vote for their own entry. When they do so, all votes get the opportunity for social sharing. This would again be another affinity connection for your Page with that Entrant that links them and increases the score towards them seeing more of your posts in their News Feed. As friends of those who have entered or voted click the links that are shared and come to the app to vote or enter themselves, this then builds further affinity connections as the entrant/voter, and friend of theirs have engaged with your Page, together building a stronger EdgeRank connection triangle (entrant/voter, friend of entrant voter, and Page) thus giving both entrant and friend of entrant a stronger possibility of your Facebook Page posts being in their News Feed. Using the Comments box plugin per entry encourages posting and when the default "Post to my profile" check remains, this further connects the poster and social networking. 2-stage voting builds another further connection for entrants and voters to return to the page to vote again, and with their next round of voting comes more social sharing and connecting options with your website and/or Facebook Page. So, the circle of connection between a fan.visitor and your business website and/or Facebook Page grows with use of tools like TabSite's Contest tool. For Admins this is a way to boost the potential of fans seeing your wall posts in their News Feed.